Boxing Training – You can learn to box at home and significantly improve your fitness at the same time. Boxing training is one of the best ways to get fit, lose weight and tone up your entire body. Boxing training will improve your coordination, control and strength, and you’ll learn real boxing skills as you go. Boxing Training Without Getting Hit! Boxing is one of those sports that many people like the idea of trying, but never do. At Fight Yourself Fit we understand how difficult it can be to get started, and how intimidating boxing gyms can seem, especially if you’ve never set foot in one. But training in a boxing gym isn’t the only option. With our boxing training system you can learn all the basics at home and improve your self-confidence and fitness, without having to fight anyone! 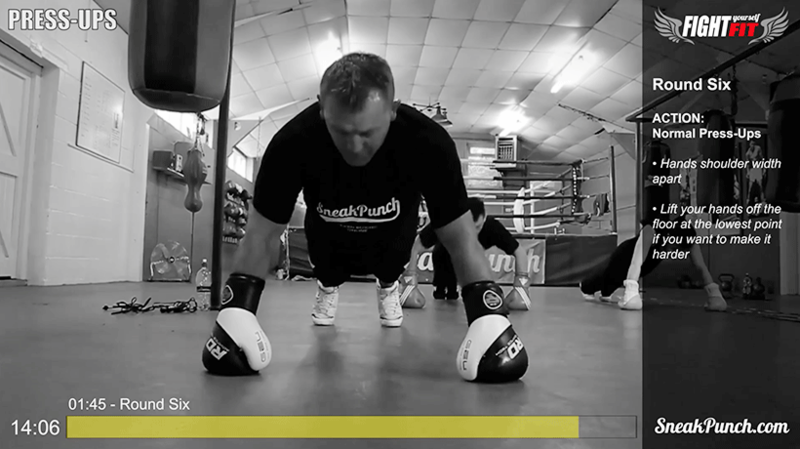 If you are really keen to join a boxing gym, but want to try out some boxing combinations on your punchbag before you go, we know you’ll love our 60 day boxing training programme. Work your way through our different boxing workouts and you’ll be amazed how much you can learn in just a few weeks. If you start the Fight Yourself Fit boxing training programme your personal boxing coach will be former world champion boxer, Cornelius Carr. You are unlikely to find this quality of boxing training in your local boxing gym because there aren’t that many former world champs around! Cornelius has a wealth of knowledge from inside the boxing world and he developed the Fight Yourself Fit system with both boxers & non-boxers in mind. Boxing training works for everyone and with our system you can start your training immediately, any day of the week, at any time. You don’t have to attend boxing classes at a time decided by your gym. You can learn to box at a time to suit you, in the comfort of your own home. If you really want to join a boxing gym, but something is stopping you from taking that step, why not try boxing at home first? You’ll be amazed at the workout you get and you’ll quickly notice your fitness improving. Our boxing workouts are organised in rounds, with different workouts based on boxing technique and power and speed. Each boxing workout is approximately 30 minutes long and believe us this really is long enough. You’ll find out just how intense boxing training is, and you’ll benefit from having a proper workout every day (if you like!). Each of our boxing workouts offer a full body workout, so you are fully in control of how often you train. If you want to have a complete body blast and learn to box in just 60 days, you can follow the easy workout schedule included in the full Fight Yourself Fit package. This will get you fit really quickly and totally fast-track your boxing training. 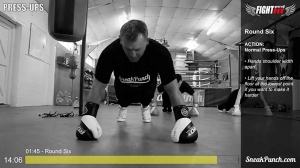 The Fight Yourself Fit boxing programme includes four power and speed based workouts, containing dynamic boxing exercises to build your boxing power and increase your speed. There are also four boxing technique workouts which break down genuine boxing combinations for you to learn and practise. Each boxing combination is taught step by step, making them very easy to follow. As you progress you will find yourself working faster and with increased strength. Our boxing training system is very progressive and you’ll find yourself working just as hard, or even harder weeks down the line! As you get used to the boxing techniques you’ll be able to exert more effort with every move, and your punches will be more and more powerful. As well as becoming a better boxer, your whole body will be fitter and stronger than ever. As you work through the sessions, the techniques do get more complex so you’ll continually be improving your boxing skills. This system really will teach you to box, improving your stance, positioning, posture, strength and punches. Boxing is a skill that many people would love to learn, but just don’t know where to start. Boxers have a self-confidence that comes from the knowledge that they can take care of themselves. It’s one thing being physically fit and in control of your body, and yes this does give people confidence, especially if they look good, have lost weight and have improved their fitness. However, being aware of your ability to defend and protect yourself is a totally different feeling – and one which few people ever really have. Boxing training will start you on a pathway towards such self-confidence and once you’ve tried it we know you’ll never go back to being the old you. If you begin your boxing training at home today you can start heading in the right direction, and you won’t ever look back.